As a Tawongan, you can appreciate how Camp helps children discover the best versions of themselves – and adults too for that matter. Over the last year, more children, families and young adults experienced Tawonga’s transformational impact than ever before in our 93-year history. This report is a celebration of this historic reach, and our way of saying “thank you” to our amazing Annual Fund supporters and to our entire Tawonga family for being a part of our beautiful, inclusive and loving Jewish community. Below, you will find personal stories that illuminate how Tawonga inspires people to actively live their Jewish values and to be thoughtful stewards of our world. These videos and narratives will take you from a unique identity-exploring Tawonga campfire to a vibrant Erev Rosh Hashanah celebration in an Oakland park, to a wedding with a special Camp twist. You’ll hear how support from the Campership Fund affected a young man’s life, how one family opted into a sacred rite of passage, Tawonga-style, and why another family chose giving to Camp as a way to honor their parents’ passing. You will also learn about key upgrades to our beautiful property on the Tuolumne River as well as other program updates that together are bringing to life a vision to provide year-round, lifelong engagement to our community. Thank you. Based on two evaluations by Summation Research Group and the Foundation for Jewish Camp, 2017 was a banner summer for Tawonga. 96% of parents surveyed reported that their children's experience was overall extremely valuable. On the staff evaluation side, in the categories of Likelihood to Recommend and Overall Satisfaction, we received a 95% rating. Answering a need to serve our older campers in every teenage year, Tawonga launched the Teen Leadership Institute (TLI) in summer 2017 – an immersive leadership training experience. After many requests from families to run a Quest Adventure Travel program just for girls, in summer 2017, Women of the Wild was born! A sisterhood crew of eight campers and two Quest leaders launched this two-week adventure with Jewish learning and experiences woven throughout, across Northern California’s most beautiful gems. They explored the beaches of Point Reyes National Seashore, magnificent Trinity Alps and caverns of Lake Shasta, rafted the Trinity River’s crystal-blue waters and journeyed through the ancient groves of Humboldt Redwoods State Park. The group emerged from their travels a bonded unit of strong, confident women of the wild! In 2017 we added a third option to our traditional Women's and Men's Campfires that takes place on the second night of Camp, called "Beyond the Binary." The Women's and Men's Campfires provide a space for campers to explore the pressures and stereotypes that they feel growing up in their gender and to empower them to be their best selves and to support one another. Campers whose gender was not reflected in the the traditional options last summer had the choice to join "Beyond the Binary." In this way, all campers were able to feel seen and supported in their gender identities – particularly those handful of campers who joined the new alternative. An expression of our value to be radically inclusive, this campfire is an example of how Tawonga continues to lead the field in gender inclusion. In case you missed Hadzy’s story above. From Jewish holiday gatherings and tot shabbats to family volunteer days, Tawongans of all ages connected with each other and their Jewish community throughout 2017. Watch over 1,000 Tawongans gathering in Oakland’s Joaquin Miller Park for what has become an annual pilgrimage to welcome the Jewish New Year together! 2017 was a big year for Tawonga’s Bar & Bat Mitzvah program, adding a second cohort of students to participate in this alternative, two-year rite of passage experience in the Bay Area, serving mostly unaffiliated families. From immersive Camp-style retreats to dynamic Jewish and social justice-focused curricula to community service mitzvah projects, these 100 students are traversing this rite of passage in a uniquely Tawongan way. Mazel tov to our 17 students who have led their b’nai mitzvah services to date! Tawongans in their 20s and 30s connected with each over the last year at gatherings both up at Camp and at local events throughout the Bay Area. Engaging this cohort of young adults, supported by our Young Alumni Board, helps to fill a need for Jewish communal engagement between the Tawonga staff years and the Family Camp years. From our first Alumni Weekend in over 10 years, to a social justice seder, open mic night and more, our alumni efforts keep the Tawonga spark alive. 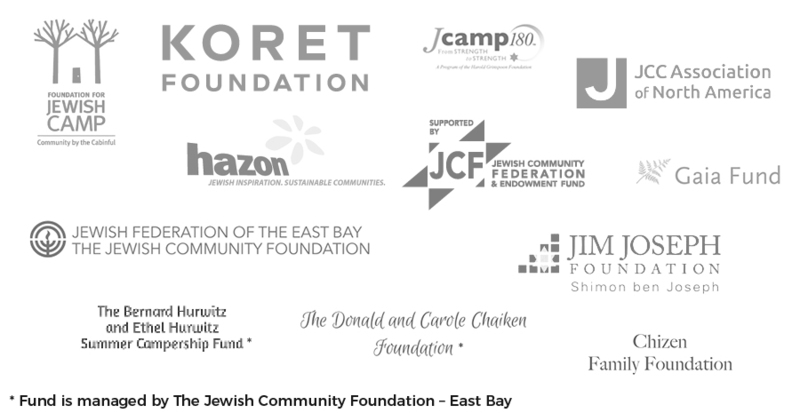 This work has also been affirmed by the Jewish Community Federation’s recent study of Bay Area Jewish life, which highlighted that the largest cohort of Bay Area Jews are young adults. Over 30 camper and staff alumni dusted off their sleeping bags and Nalgenes in September, 2017 to head up to Tawonga for the first alumni weekend gathering in over a decade. Spearheaded by our Young Alumni Board, the weekend was a chance for alums to come back to the place they loved after being away for many years (and not yet with families of their own to join for a Family Camp Weekend). Together with this special community, these alumni revisited their love of Camp, the beautiful, sacred land and reconnected to their Jewish identities that Tawonga has a way of inspiring. Read More. In a long-awaited act of healing and redemption, in March, 2017, 20 volunteers joined together at Tawonga to replenish trees lost in the 2013 Rim Fire and to give back to the land. Together, these volunteers — mostly wilderness staff and their partners — planted a total of 50 trees across two areas of Camp: in the garden, expanding our fruit tree orchard, and in the Freedom Forest, an area of Camp that had been beloved due to its enclosed feeling. Read More. For Passover, 2017, Tawonga alumni gathered together at Wise Sons Jewish Deli in San Francisco’s Mission District for the first-ever (and sold-out) Tawonga Social Justice Seder. Facilitated by leaders from Tawongans Organizing for Racial Justice (TORJ) and Tawonga’s Young Alumni Board, this was an opportunity to celebrate Passover with a self-reflective, progressive twist – through the lens of racial justice and liberation today for communities of color. Read More. In May, 2017, Tawonga reached its biggest audience yet, on the wings of Southwest. Alum and best-selling author and podcaster Steve Almond wrote a touching personal essay about returning to Tawonga with his family for Southwest Magazine, with a monthly readership of 5 million people – more than People, TIME and Rolling Stone! Read the article. Thanks to generous Tawonga donors, a beautiful new Central Bathhouse is rising immediately next to the aging Boys’ Bathhouse at Camp, on schedule to open later this year. In 2017, Tawonga’s new all-season cabins, Tenaya and Tioga opened for use to rave reviews! Tawonga’s Garden, a beloved space where campers connect to the food they eat, expanded by a quarter of an acre in 2017. This newfound sunny gardening space will double our vegetable growing area and crop production. In spring 2017, 20 volunteers joined together at Tawonga to give back to the land by planting a total of 50 trees at Camp, including 20 fruit trees in the Garden’s orchard. Then over the summer, Teen Leadership Institute participants, with the support of our Buildings & Grounds crew, expanded the Farm and Garden fence-line to accommodate the growing needs for this increasingly popular program area and added a new welcoming gate for all to pass through. On the Tawonga Farm front, bunnies joined the animal life this past year (adding to our goats and chickens), which campers thoroughly enjoyed feeding many garden-grown salads. Read more about Tawonga’s Farm and Garden here. These individuals and institutions supporting Camp Tawonga’s Annual Fund are the true change-makers and creators of impact for so many children, families and young adults. Your support means everything. Thank you! Our Legacy Society members ensure Camp’s future by making Tawonga a philanthropic priority. Thank you to our members – your investment is deeply appreciated. Tawonga Legacy Society members have made a bequest or planned gift in their estate plans. Thank you to JCamp 180 for awarding Camp Tawonga with their 2017 Impact in Technology Award! This award is given to a Jewish camp that has integrated the use of technology for internal effectiveness and has improved communications, community-building and/or fundraising. Friends, Friends, Friends . . . We'll See You Again!